Singapore Airlines Group has reported improved profits for the quarter and year ending 31-Mar-2015 (FY2015) driven by a recovery in yields. The SIA mainline operation, full-service regional subsidiary SilkAir and SIA Cargo all recorded improvements in their operating performance for FY2015, although SIA Cargo remained in the red. The SIA Group should be able to boost profitability further in FY2016 driven partially by fuel cost reductions. But market conditions remain relatively challenging and profits are unlikely to return to pre global financial crisis levels. Mainline capacity will again be flat in FY2016 and there should be an opportunity to boost yields further at the parent airline as premium economy is introduced. But the group is accelerating capacity expansion at SilkAir and long-haul LCC subsidiary Scoot, which could put pressure on yields and load factors in some markets. The SIA Group reported on 14-May-2015 a 58% increase in operating profit for the year ending 31-Mar-2015 (FY2015) to SGD409 million (USD318 million). The group’s net profit improved by a more modest 3% to SGD368 million (USD286 million) due to losses at associate companies and joint ventures. The SGD409 million operating profit represents the highest annual profit since FY2011. But SIA is still well below its pre-GFC high mark of about SGD2 billion in FY2008. At a net level SIA has now accrued profits of a relatively modest SGD300 to SGD400 million for four consecutive years. SIA’s record of profits every year since it was established over 40 years ago is still intact but its glory days of high double digits margins are clearly in the past. SIA’s ability to remain profitable despite intensifying competitions and challenging market conditions in Southeast Asia is noteworthy. Southeast Asia was a tough market in 2014 due to overcapacity and unpredictable external factors such as the political instability in Thailand. As CAPA previously highlighted, SIA and SilkAir were two of only seven publicly listed airlines that were profitable in CY2014 while 11 were loss-making. For the quarter ending 31-Mar-2015 (4QFY2015) the SIA Group turned a SGD92 million operating profit (USD68 million) compared to an operating loss of SGD62 million (USD49 million) in 4QFY2014. The Group’s net result improved by 47% from a profit of SGD27 million (USD21 million) in 4QFY2014 to a profit of SGD40 million (USD30 million) in 4QFY2015. The SIA Group now includes five airline subsidiaries – SIA the parent airline, SilkAir, Scoot, SIA Cargo and short-haul LCC Tigerair. All are 100% owned except Tigerair, which became a subsidiary in Oct-2014 as SIA increased its stake to 55.8%. The Tigerair Group continues to be listed separately and earlier reported a net loss of SGD264 million (USD205 million) for FY2015 compared to a loss of SGD223 million (USD177 million) for FY2014. 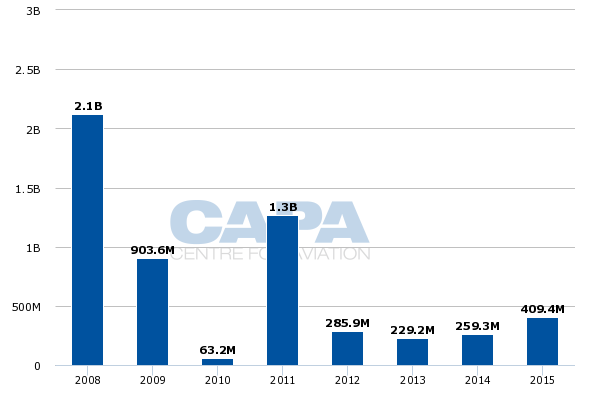 As CAPA wrote on 7-May-2015, Tigerair should be able to return to profitability in FY2016, boosted by capacity reductions, lower fuel prices and the divestment of stakes in unprofitable overseas joint ventures. A positive contribution from Tigerair should also help SIA Group improve its bottom line in FY2016. Tigerair incurred an operating loss of SGD40 million (USD31 million) for FY2015, including an operating loss of SGD2.3 million (USD1.7 million) in 4QFY2015. Excluding Tigerair, the SIA Group operating profit was SGD419 million for FY2015 (USD310 million) and SGD105 million (USD83 million) for 4QFY2015. These figures provide a more relevant comparison than the FY2015 figures earlier in this report as Tigerair was not included in operating figures in FY2014 (although as an associate company Tigerair did previously have an impact on SIA Group net figures). Tigerair improved its operating result in FY2015 by 23% compared to a SGD62 million (USD49 million) operating loss in FY2014. SIA the parent airline recorded a 33% improvement in operating profits in FY2015 while SilkAir recorded a 17% improvement and SIA Cargo a 78% improvement. SIA the parent airline turned an operating profit of SGD340 (USD264 million) in FY2015 and therefore accounted for nearly all of the group’s total profit of SGD409 million (USD318 million). SilkAir had a modest operating profit of SGD41 million (USD32 million) in FY2015 while SIA Cargo remained in the red with a relatively modest loss of SGD22 million (USD17 million). The SIA Group does not disclose any financial figures for Scoot and other smaller but generally profitable non-airline subsidiaries. Improved yields and lower unit costs drove the better performance at SIA mainline. Load factor was relatively flat, down just 0.4ppt to 78.5%. ASKs and RPKs were also relatively flat with year-over-year reductions of less than 1%. SIA’s passenger yield was up 0.9% for the year and an encouraging 2.7% in 4QFY2015. Yields rebounded in 2HFY2015 after a challenging first half, when market conditions in Southeast Asia were particularly unfavourable. Unit costs were down 2.2% for both the quarter and the year. But unit costs excluding fuel were up 2% for the year and 3.8% for the quarter. While SIA benefitted from the lower fuel prices this was partially offset by a fuel hedging loss of SGD457 million (USD337 million) in FY2015 with SGD287 million (USD226 million) coming in the fiscal fourth quarter as fuel prices dropped sharply. Total fuel expenditure for FY2015 dropped by 4% to SGD4.536 billion (USD3.346 billion). SIA paid an after hedging average of USD103 per barrel in 4QFY2015 compared to an average before hedging price of USD73. SIA has hedged 40.9% of its expected jet fuel consumption in FY2016 at an average price of USD106 per barrel. But its average fuel price will gradually drop in FY2016 as hedges at lower prices start to kick in. This should help SIA further improve its profitability as the year progresses. SIA should also be able to further improve yields at the parent airline in FY2016 as premium economy is introduced. SIA has seen an improvement in its passenger mix, an indication that business class sales are holding up well while intense competition continues to impact economy yields. Premium economy is debuting on Singapore-Sydney on 9-Aug-2015 and will be offered on some flights to 20 destinations by early 2016. SIA began selling premium economy on all these flights in early Feb-2015 and is launching a marketing campaign on 21-May-2015. SIA is content with the response so far and is confident it will see an uptick in bookings as it gets closer to the launch date and starts more actively marketing the new product. But SIA is also prepared to offer promotional pricing should there be a need to stimulate demand. SIA so far has committed to retrofitting all 19 of its A380s and 19 of its 777-300ERs with premium economy, with all 38 of these aircraft to be retrofitted by early Jan-2016. Premium economy will also be incorporated in the new A350-900 fleet. SIA plans to take its first of 70 A350s in 1QCY2016 (4QFY2016) and have three A350-900s in operation at the end of FY2016. The A350s will be in three-class configuration and feature its latest business class and economy seats, which are now on six new 777-300ERs (with two more new 777-300ERs to be delivered in the coming months) and are being retrofitted in FY2016 on 19 777-300ERs. SIA’s mainline fleet will grow by one aircraft in FY2016 as nine aircraft are delivered and eight are phased out. In addition to the three A350-900s SIA will place into service four A330-300s and two 777-300ERs (which will be configured with the new business and economy seats but not have premium economy). Four A330-300s and four 777s (two 777-200s, one 777-300 and one 777-200ER) are being decommissioned. SIA expects total ASKs at the parent airline to again be flat in FY2016. SIA pointed out at its FY2015 analysts briefing on 15-May-2015 that the parent airline will add frequencies on some existing routes but this will be offset by the reduction in capacity on existing flights brought about by the introduction of premium economy. As CAPA previously highlighted, the initial phase of the premium economy introduction will result in a total seat capacity reduction of about 1.5% across the entire existing network, including about a 4% reduction to Europe. There will be further reductions in 4QFY2016, when the A350s enter service, and in FY2017 as more A350s are delivered and potentially more 777-300ERs are retrofitted. Flat capacity overall and a reduction in economy class capacity could result in market share reductions, particularly in long-haul markets. But SIA is not too concerned about market share as the parent airline is reinforcing its position as a premium carrier in a bid to improve profitability. FY2016 could be a pivotal year as SIA is banking on premium economy improving yields and therefore profitability. SilkAir, however, could be in a much more difficult position to improve profitability in FY2016 as it re-accelerates expansion. SIA plans to grow SilkAir ASKs by about 13% in FY2016. SilkAir recorded high double-digit ASK growth for four consecutive years from FY2011 through FY2014 but grew ASKs by only 5% in FY2015. The group originally planned 13% ASK growth at SilkAir for FY2015 but significantly reduced capacity growth in response to the challenging conditions in the regional market. The decision in early FY2015 to slow capacity growth was sensible as SilkAir was able to boost load factors and yields. SilkAir recorded a 1.5% improvement to yields in FY2015 and a 0.6ppts improvement in load factor as a 6.3% increase in RPKs outstripped a 5.4% increase in ASKs. This reverses a discouraging trend in FY2014, when SilkAir reported a 10% reduction in yields and a 4ppts drop in load factor. But there is a risk the return of double-digit capacity growth in FY2016 will again pressure load factors and yields. SilkAir’s yields and load factors are still well below FY2013 levels and competition in Southeast Asia’s regional market remains fierce. SilkAir plans to expand its fleet in FY2016 by two aircraft for a total of 29. SilkAir is aiming to take five additional 737-800s in FY2016 while two A320s and one A319 are phased out. SilkAir ended FY2015 with a fleet of nine 737-800s and 20 A320 family aircraft. It took its first two 737-800s in 4QFY2014 and seven 737-800s in FY2015. The 13% increase in ASKs will be driven mainly by up-gauging existing flights from A319/A320s to larger 737-800. But SilkAir also plans to add frequencies on some routes while launching one or two new routes. So far it has announced one new destination for FY2016, Cairns in Australia, which will commence on 30-May-2015. Scoot is seeing the fastest growth of all the SIA Group subsidiaries although ASK figures are not provided. Scoot’s operating fleet is expanding from six to 11 aircraft in FY2016. Nine 787s (five 787-8s and four 787-9s) are being delivered while the last four 777-200s will be phased out. Scoot took its first two of 20 787s in 4QFY2015, which replaced two of its original fleet of six 777-200s. As CAPA previously outlined, Scoot will be pursuing capacity and network expansion from Jul-2015 after it takes delivery of the first of five growth aircraft intended for FY2016. Scoot has not grown since late 2013 (3QFY2014), when it added its sixth 777. An anticipated increase in transit traffic with Tigerair should help Scoot absorb the additional capacity. The SIA Group stated in the FY2015 results presentation that the two LCC subsidiaries saw a doubling of transit traffic in Jan-2015 but this comes on a very low base. But even with more feed from Tigerair the rapid capacity expansion will likely put pressure on Scoot’s yield and load factors. It will also take time for Scoot’s new routes to mature while fleet transition costs will be incurred. Scoot is likely to remain unprofitable in FY2016. Could FY2016 be the year SIA Cargo returns to profitability? SIA Cargo could potentially become profitable in FY2016 as it continues its recovery. SIA Cargo was last profitable in FY2011 and has seen a steady reduction in losses over the last two years. But profitability is hardly guaranteed as market conditions remain challenging. It is also difficult to predict how macroeconomic trends may impact the cargo business in the coming year. SIA Cargo should see relatively flat capacity as it intends to maintain its freighter fleet at the current level of eight 747-400Fs. SIA Cargo has been at the eight-aircraft level for one year after decommissioning five 747-400s between Dec-2012 and May-2014. SIA executives said at the results briefing that it sees eight freighters as the right fleet size for the cargo subsidiary going forward as it provides the right mix of all-cargo and belly capacity. While Malaysia Airlines and Thai Airways are ceasing freighter operations in 2015, leaving SIA as the only Southeast Asian flag carrier with freighters, SIA still sees freighters as a crucial part of its cargo business. Freighters are used to optimise the SIA Cargo network and fill in the gaps where belly capacity is not sufficient. Balancing the network is important as over half of SIA’s cargo traffic is transit. The SIA Group also now includes two overseas airline affiliates in Indian full-service airline Vistara and Thai long-haul LCC NokScoot. Both carriers commenced operations in 4QFY2015 although NokScoot has so far only operated charter flights. Vistara’s fleet is slated to expand by three A320s in FY2016 to nine aircraft. The fleet at NokScoot, which currently has three 777-200s, is not expected to grow due in part to the regulatory delays it has encountered in launching scheduled services to China, Japan and South Korea. Bangkok-Singapore will become NokScoot’s first scheduled route on 20-May-2015 as the new joint venture carrier continues to work towards launching services to China, Japan and South Korea. NokScoot is confident it can resolve within the next few weeks CAAC issues that has forced it to delay the planned launch of services to Nanjing. Vistara and NokScoot are key components of the new SIA Group strategy which aims to diversify its portfolio outside its home market Singapore, where the Group correctly sees limited growth opportunities. In Singapore the group is focusing growth on the long-haul low-cost sector and in the emerging LCC transit traffic sector. At the full-service end it is keen to leverage its network within Southeast Asia and Southwest Pacific as the long-haul market to Europe and North America remains challenging. SilkAir is being used to strengthen connections to Southeast Asia, which the group views as its extended home market. The group’s strategy for beefing up Southwest Pacific has been implemented through its partnership and equity stake in Virgin Australia and its new alliance with Air New Zealand, which resumed services to Singapore in Jan-2015. The focus on Southeast Asia, Australia and New Zealand is sensible as it enables SIA to rely less on the intensely competitive long-haul markets connecting Southeast Asia to Europe and the Americas. SIA believes there have been structural changes in the Europe and Americas markets. While these changes make it difficult to pursue expansion, SIA continues to look for opportunities to add long-haul flights. New flights to North America could potentially be launched if SIA succeeds in its longstanding efforts to secure uplift rights from intermediary hubs. SIA dropped non-stop all-premium flights to the US in late 2013 and at this point only regards one-stop flights as commercially feasible although it will evaluate new ultra long-haul widebody aircraft alternatives if they become available. SIA also continues to work on expanding its partnership portfolio to improve its network in the Americas and Europe as well as North Asia. Partnerships give SIA access to 180 offline markets as of the end of FY2015, an increase of 45% compared to the end of FY2014. 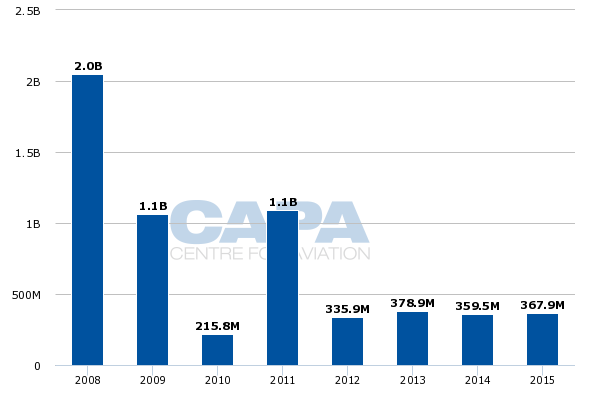 The number of codeshare flights increased by 59% in FY2015 to 8,081 weekly frequencies. As of the end FY2015, Singapore Airlines and SilkAir combined operated 1,097 weekly flights from Singapore to 100 destinations. SIA Group is also diversifying its business by developing new areas outside its core airline operations. The Group particularly sees opportunities to use its frequent flyer programme, KrisFlyer, to generate new revenues and improve the group’s overall profitability. The SIA Group has a lot on its plate in FY2016. Scoot and SilkAir are accelerating growth and NokScoot and Vistara are being established, while the parent airline has two major milestones with the introduction of premium economy and the A350. As a result Southeast Asia’s largest airline group still faces several challenges and risks. But lower fuel prices and disciplined capacity should lead to higher profits at the parent airline and therefore the overall group. More significantly if the year goes smoothly SIA will make progress on laying the foundation for a brighter long-term outlook. But it is likely that at least some of SIA’s bets will go awry. Scoot, NokScoot and Vistara are by no means over the hump while SilkAir’s expansion plan and order book could prove to be overambitious. At the parent airline how the premium economy experiment pans out is a also a huge unknown. This presents a complex variety of management challenges and it would not be surprising if it takes some time to get each of the linkages running smoothly.